Medical: Including Blood bags, Colostomy bags, DVT bags, Solution bags, EVA bags, Medical Mattresses, produced on HF welding machines, high frequency welding machines, rotary and inline machinery. The materials can be PVC, Medical Grade PVC and Non PVC. Tarpaulin Awnings and Banners: Including HF travelling head, fixed head and gantry, hot air in-line and fixed head, gluing, sewing and ultrasonic system. Plotters conveyor or fixed table, water jet cutting systems and associated equipment. Packaging: Including Form Fill & Seal, Blister Forming, for both food and non food, rotary and inline machinery, for Soft Crease Boxes, clam Shell and Standard Blisters, using thermo-contact and HF welding technology. Nuclear: Including Bag Sealers, Rotary Welders and specialised applications. We have received an order for a SM-321-TA tarpulin welder from one of the UKs Leading tarpaulin manufacturers. The machine can produce curtains in 20 minutes and can also weld vertical and horizontal webbing as well as anti vandal webbing and steel rope. Multiple tool CAD/CAM plotters, blade, laser, waterjet, ultrasonic, plasma cutting. 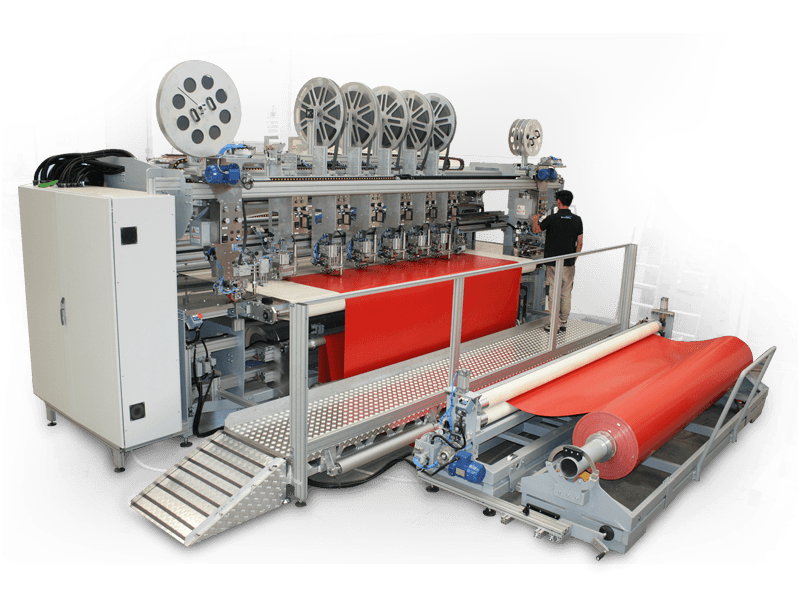 Bonding machines with hot air, Liquid Glue and Rotosonic technology. Cutting, hot air welding, Liquid Glue bonding and sewing for the production of awnings, blinds and insect screens. High frequency welding machines for sign production. High frequency welding machines for medical bags production. High frequency welding machines for car components and fittings. High frequency welding machine for PVC and PET-G blister packing. Cutting, hot air welding and sewing for the production of covers in technical fabrics. High frequency welding machines for stationery items. High frequency welding machines for the production of babyhood items.